Charles Brodie Patterson was a Canadian publisher, author and editor and one of the great early New Thought leaders. Patterson was born in 1854 in Nova Scotia. He graduated from the Pictou Academy in Pictou, Nova Scotia and began pursuing mercantile activites afterward. At the age of 31, Charles Brodie moved to Harford, Connecticut for treatment from a mental healer. He then studied at the Mental Science Institute in the city and also attended the Alliance of Divine Unity. In 1888, Patterson established the Metaphysical Alliance of Hartford, and served as its president until 1904. In 1893 he opened the Alliance Publishing Company in New York City. He published a variety of books from New Thought and Metaphysical authors; Brodie also published about 15 new thought books of his own. Patterson was also the editor for the Mind Magazine, and the Library of Health Journal, as well as Arena, which was one of the most influential New Thought publication during its time. 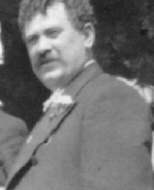 Patterson was also a past president of the International New Thought Alliance, and also served as president of the International Metpahysical League from 1899 to 1903, and later, the New Thought Federation. After Charles B. Patterson's death, he was often labeled the New Thought Movement's leader in the early 20th century.